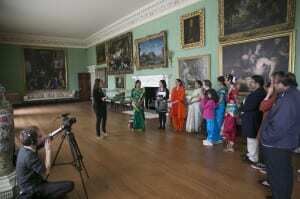 ‘The Trappings of Trade’, a display co-curated by UCL researchers and National Trust staff and volunteers, was exhibited at Osterley Park and House in Hounslow from 27 July to 3 November 2013. The exhibition was designed to give visitors a valuable insight into the luxury objects brought from Asia by the East India Company in the eighteenth century, and how such goods shaped Georgian and Victorian tastes. The display featured Chinese-lacquered chests, Gujarati fabrics and Chinese armorial porcelain. Built in the sixteenth century, Osterley House was extensively remodelled between 1761 and 1780 by the Scottish architect Robert Adam. The Child Family, which owned Osterley in this period, also played key governance roles in the East India Company. Having started out as goldsmiths, the family then turned to banking, subsequently lavishing a large portion of their wealth on Adam’s neo-classical improvements, which can still be seen at Osterley today. Along side eighteenth-century Asian objects, the display also featured Asian objects belonging to residents in Hounslow. Members of the local community in Hounslow contributed their ideas and oral histories to the display and reflected upon the ways in which people and objects continue to move along the routes established by the East India Company.